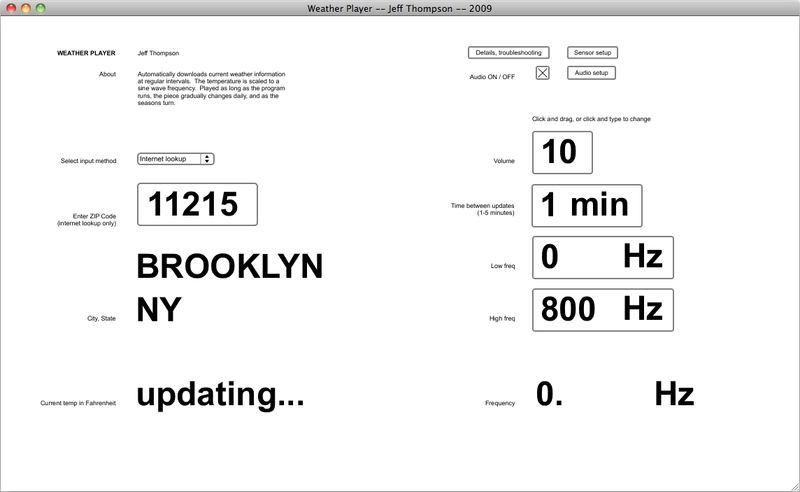 "Weather Player" is software which automatically downloads the current temperature at a given location and at specified intervals. It then scales that value to the pitch of a sinewave played through a set of speakers. The piece is played continuously, gradually changing throughout the day and seasons. In its ideal installation, the piece would run for a year — a visitor listening for a few minutes could hear very small variations, but returning later they would hold in their memory the previous pitch and be forced to hear harmonies with the mental version of their last visit, rather than an immediate contrast of harmony like in traditional music.